Since the salad should chill for at least four hours, it a perfect make-ahead option for special events, taking to potlucks, events, or just getting ahead on a typical busy weekday. Make it in the morning, or even the night before, and all that’s left to do is pour on the dressing and toss in the croutons. This Italian salad is quite versatile, and can be served as either a lunchtime entrée, alongside a couple of Copycat Restaurant Breadsticks, or as a flavorful accompaniment to your main course at dinner. Try pairing it with hearty Tuscan Beef and Sausage Ragù or Creamy Chicken Alfredo. There are dozens of Italian dressings available at any grocery store, but why not make it yourself? Not only is it surprisingly easy to do, it is so much tastier than the bottled variety. It’s economical. Making your own dressing is less expensive and less wasteful, since you can either make the exact amount needed for a single meal, or whip up a big batch to store in the fridge and keep using throughout the week. It’s Healthier. 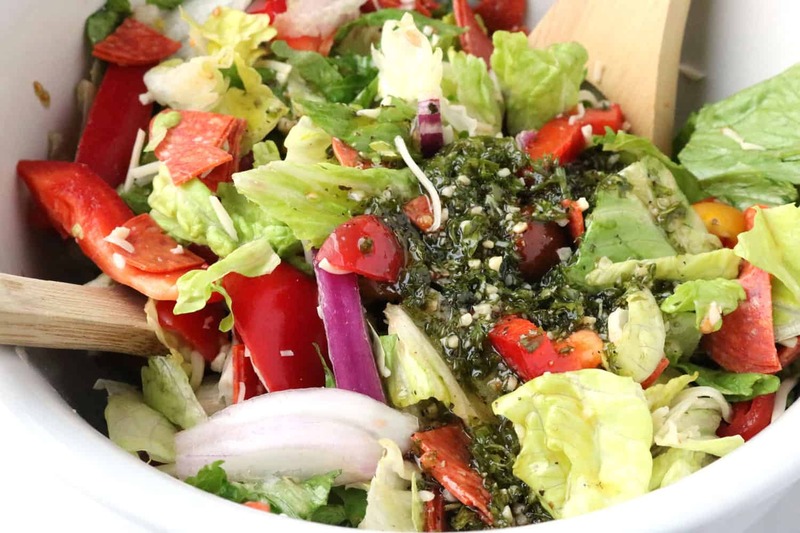 With homemade Italian dressing, you can eliminate the additives, preservatives, and extra sugars that are often found lurking in those store-bought options. You can customize. It’s easy to tailor homemade dressing to suit your specific taste. You can also try out unique recipes that feature less common ingredients. Most Italian dressings typically include wither balsamic vinegar or red wine vinegar, but this one uses seasoned rice vinegar. The ingredient that gives sushi rice that slightly sweet taste, seasoned rice vinegar is made by adding either sake, or sugar and salt, to regular white rice vinegar. It is great choice for salad dressings, as it is less acidic and provides a balanced, mild flavor. 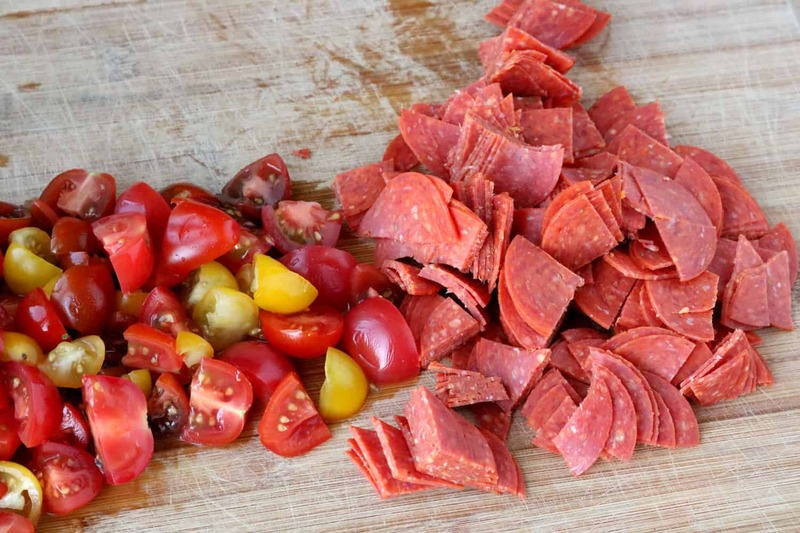 First, cut the cherry tomatoes and the pepperoni into quarters. 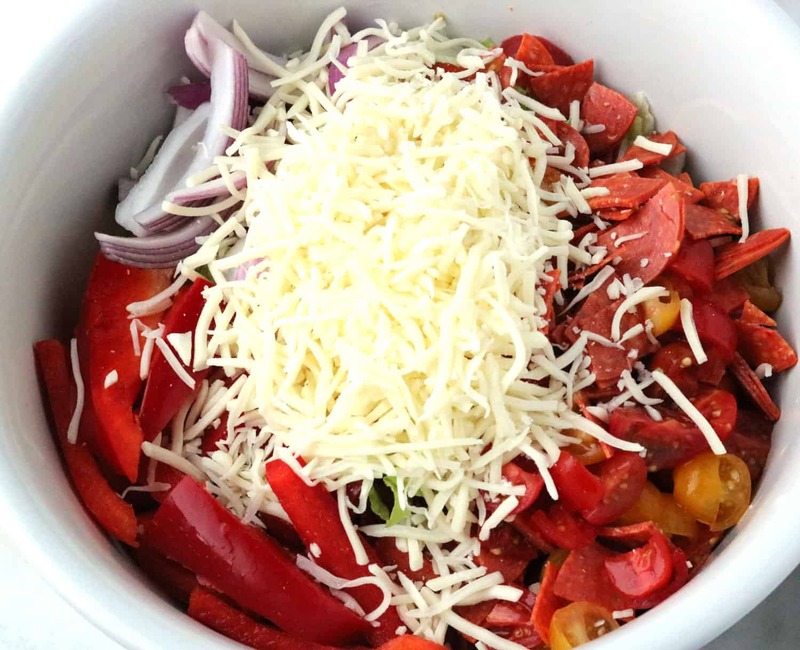 Next, add the cherry tomatoes and pepperoni, along with the lettuce, sliced onion, sweet red peppers, and shredded mozzarella cheese, to a large bowl. Toss to mix well, cover the salad, and place in fridge. Chill the salad for at least four hours so that the flavors fully combine. Place olive oil, seasoned rice vinegar, chopped parsley, Italian seasoning, minced garlic, plus some salt and pepper in a jar. Seal the jar with an air-tight lid, and shake vigorously to combine. Pour the dressing over the salad and give it a good toss to fully incorporate. 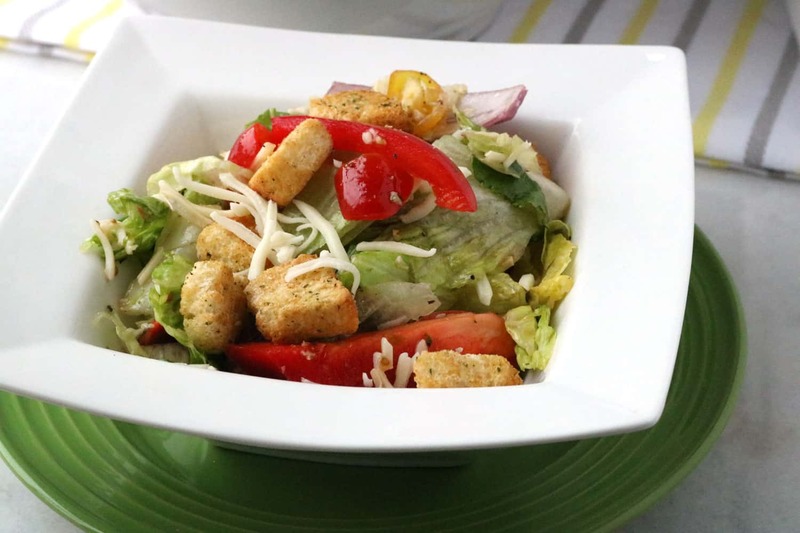 Top the salad with the croutons, and you are ready to serve. 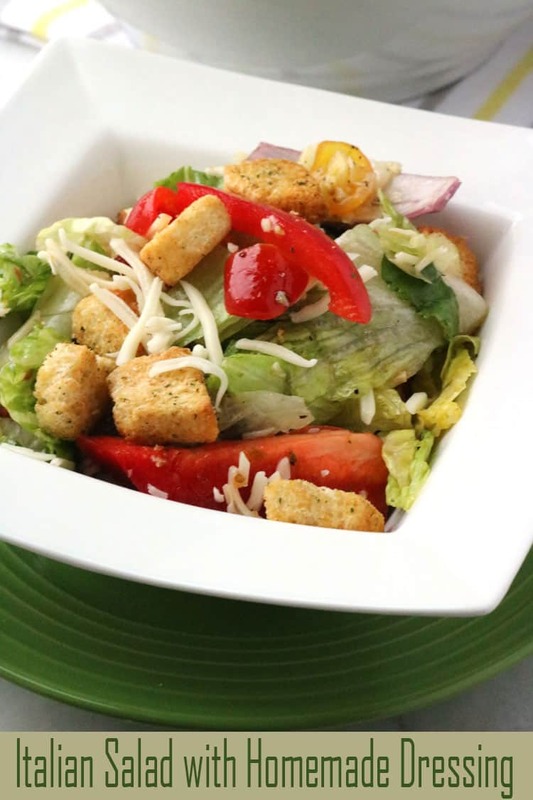 Italian Salad with Homemade Italian Dressing is packed with zesty Italian flavors. Add first six ingredients to a large bowl and toss together to combine. Cover the salad and chill for four or more hours. Before serving, combine the next seven ingredients in a jar with a tight lid and shake to combine. 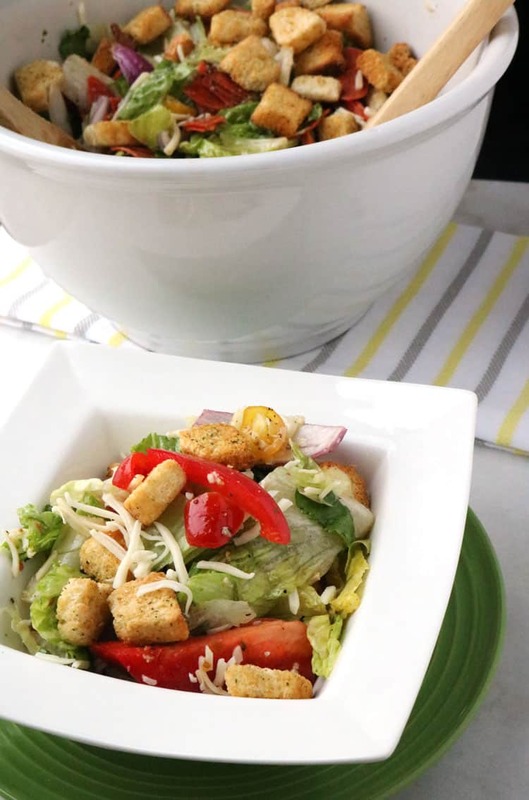 Pour over salad and toss the salad to incorporate throughout the salad. 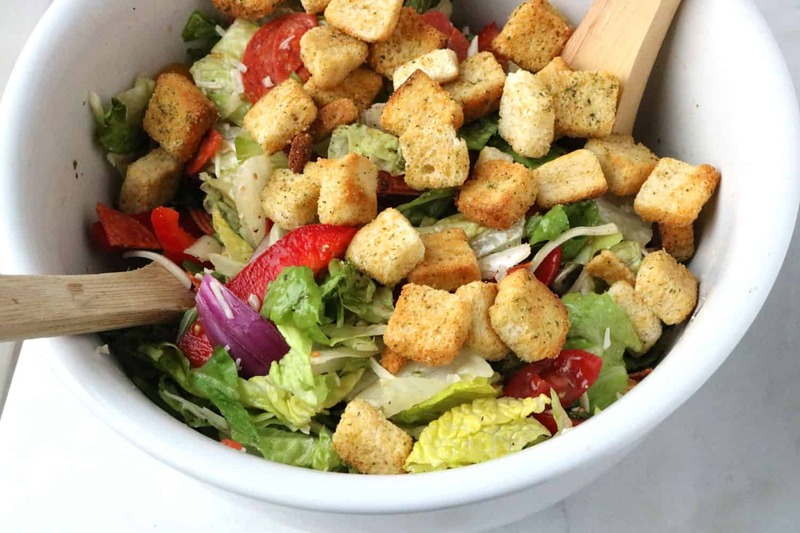 Top the salad with croutons and serve. Makes 6 servings.